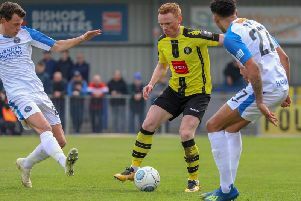 Harrogate Town have completed their second loan signing in the space of a week. Barnsley winger Dylan Mottley-Henry has joined the National League play-off hopefuls until the end of the season, following Luton Town defender Jack Senior into Wetherby Road. “He’s an exciting player full of pace and power," Town's assistant-manager Paul Thirlwell said of the club's newest addition. "Barnsley think a lot of him, so we are really pleased to get him. “He’s been out on loan to Tranmere already and helped them go up last season, so hopefully he is going to come in and make a really positive contribution. “I think he’ll fit in well to the way we want to play, his difference is his out-and-out pace and power and hopefully he’s got that eye for a goal as well. Adding that into the mix makes us stronger and improves the competition for places. "To add that extra dimension to what is already a very strong squad is exciting for everyone." Born in Leeds, Mottley-Henry began his footballing career at Bradford City, where he would go on to make his professional debut, before being offered his first pro contract under Phil Parkinson. He spent time on loan at Altrincham and Bradford Park Avenue while with the Bantams, before joining Barnsley at the beginning of the 2016/17 campaign. Described as "quick and tricky" by his current employers, Mottley-Henry has experienced League Two and National League football while contracted to the Tykes, with loan spells at Tranmere Rovers and Chesterfield. He was part of the 2017/18 Tranmere side that gained promotion from The National League, making 14 appearances. The League Two outfit came back in for him at the beginning of the 2018/19 season, securing the winger on loan until January, though that spell was cut short in December due a hamstring injury. Mottley-Henry will wear the number 22 shirt at Town and trained with his new team-mates for the first time on Thursday morning. He will be available for this weekend’s trip to Dover Athletic, subject to the relevant FA and National League approval.